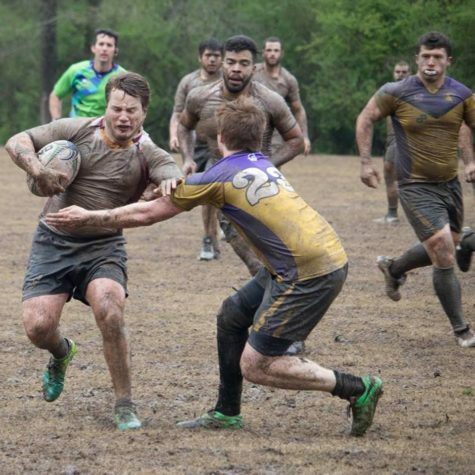 The rugby team positions themselves on defense against the University of San Francisco in Santa Clara, California on April 23 at the Jesuit Cup. 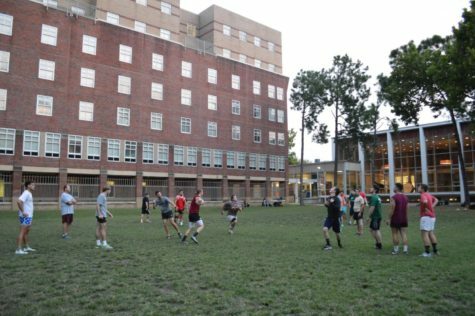 The team finished in seventh place out of eight teams and had a record of 1-4, winning the Father Engh Bowl. 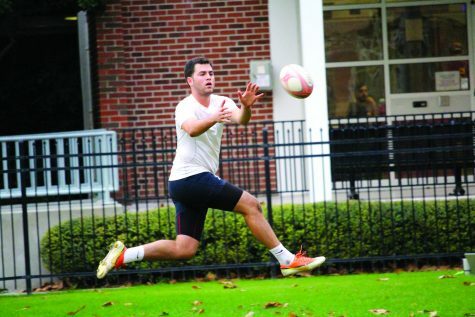 With its first invitation to compete in the Jesuit Cup, the rugby team finished with a 1-4 record. 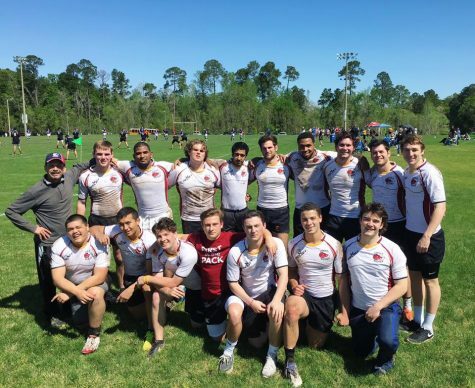 Traveling around 2,238 miles to Santa Clara, the Wolf Pack expected a lot of competition against Jesuit rugby teams across the nation but finished in seventh place out of eight teams after two days of games. 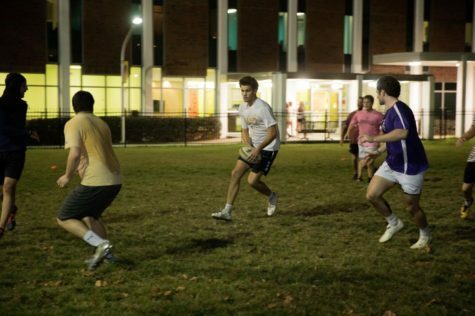 Vincent Duhé, history and mass communication junior, said the team had to adapt to the high level of play from different teams at the seven’s tournament. 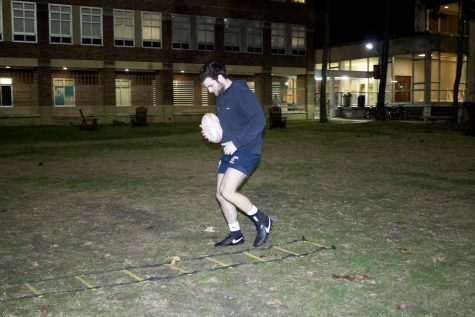 “We haven’t played against anyone at that level for sevens in a long time,” Duhé said. With the team suffering from lack of workouts over the break and adjusting from a 15’s mindset to a seven’s tournament, Loyola was looking at a tough challenge in California. 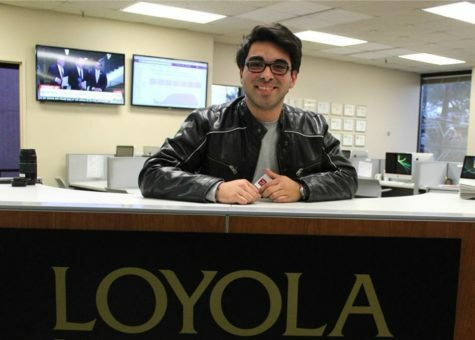 On the first day of competition, Loyola suffered two scoreless matches against St. Joseph’s University and Santa Clara University, who were the eventual tournament champions. The Wolf Pack managed to put points on the board against Gonzaga University in the third game but lost 34-14. The team play was rough at the beginning of the tournament, but improvements were made once they got accustomed to the style of play, according to Duhé. “I think that as we started to play more and more games, we got more comfortable and competitive in the rest of our games,” Duhé said. On the second day, the Wolf Pack faced the only non-Jesuit team, Notre Dame University in their fourth game. The Wolf Pack was down 10-7 at the half, but the Fighting Irish pulled away in the second half for a 31-12 win, sending the Wolf Pack to the seventh place game against the University of San Francisco Dons. As both schools came into their final game winless, they looked to leave Santa Clara with a win and the Father Engh Bowl, which is awarded to the seventh place finisher. The game was tight, and the Wolf Pack was tied with the Dons 5-5 at the half. 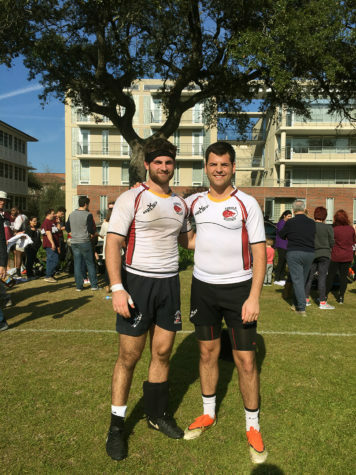 Loyola went up 12-5, but in the final minutes, USF scored a try that tied the game at 12, sending it to sudden death overtime. 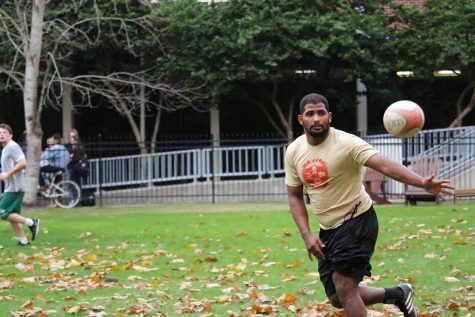 In overtime, the Wolf Pack capitalized off a turnover by the Dons, and Duhé put the ball past the try line for a 17-12 victory. Connor Delahunty, criminal justice senior and team captain, said the team gained needed experience while in Santa Clara, and the win and losses will help improve how the team operates for the upcoming seasons. “We have the games on tape, and we should be able to look at our mistakes and see how the higher tier teams were able to beat us,” Delahunty said. Winning the Father Engh Bowl gives the team a sense of optimism heading into the future, according to Delahunty. “This was still great for our club because we are getting our name out there. 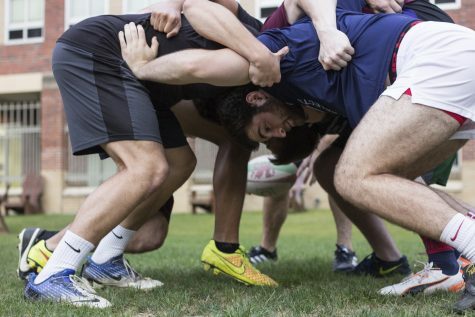 Hopefully, students applying to college will see Loyola as a good school with a rugby team that is good enough to travel across the country,” Delahunty said. With the trip in the books, the rugby team looks forward to next season, after learning from the highs and lows of their 6-1 15’s season and 3-6 seven’s season. “I think the trip definitely made us closer with each other, and we hope to be back next year and be much more competitive,” Duhé said.